In older times, traditional sweets were made from the boiled thick grape juice which apart from honey was the only other available sweetener. Such sweet grape products were especially made in village clusters that produced grapes in abundance. In 1801 Clarke noted that, “perhaps there is no part in the world where the vine yields such redundant and luscious fruit. The juice of the Cyprian grape resembles a concentrated essence.” (Cobham, 1908: p.80). Apart from wine making, grapes were consumed fresh, dried in the form of raisins and their juice was used for making a range of different sweet products which formed part of the people’s daily diet. 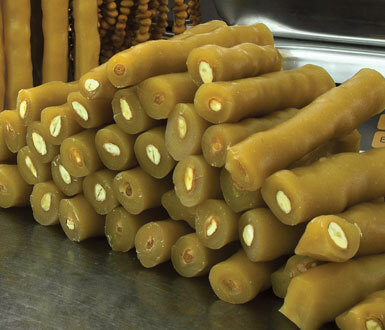 Most common of these traditional sweets that are still produced extensively are palouzes and soujoukos. Kiofterka, epsima and retselia are names for other traditional grape products that are still made today at rural homes, especially by women in the wine-villages located on the southern slopes of the Troodos massif. All of these traditional sweets are still made using methods that are no different from those of our great ancestors. All grape products are made from the must – the juice that has been extracted following mechanical pressing (the old traditional method of foot pressing is non-existent today). 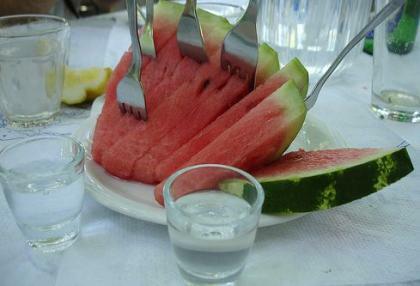 In Cyprus, the grape must comes mainly from the indigenous white xynisteri and to a lesser extent from the red variety ‘mavro’. Grapes are harvested during September and October, the period that all grape products were traditionally made. The must is then sieved and placed in a large cauldron where it is slowly heated up. A special kind of white soil, calledasproyi is then added to the boiling must to assist in the removal of impurities causing them to rise on the surface where they are collected and removed. Once the cleansing process is complete, the must is left to cool down. 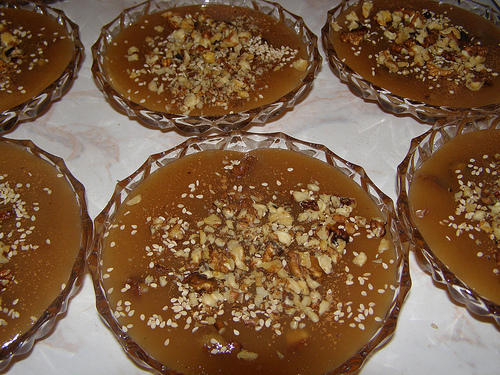 This is a thick-jelly like sweet which is made by adding 10 kg of clean grape must with 1 kg of flour and heating the mixture while stirring continuously until it is coagulated, adding rosewater, cinnamon and mastic towards the end so as to maintain their aroma. Palouzes is then poured into plates where it is left to cool down. 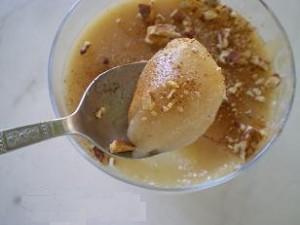 Some people enjoy consuming hot palouzes which has just been removed from the heat but commonly it is served cold with a garnish of almonds or walnuts, whole or crushed. Due to its high moisture content, it has a few days of shelf life if kept in refrigeration. Palouzes that is left to dry in the shade is then cut in rectangular shaped pieces to give another traditional sweet food, kiofterka, which have a longer life. 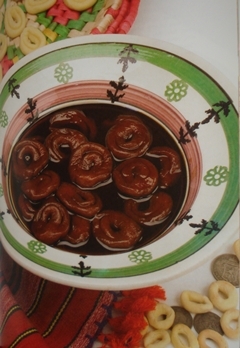 Kiofterka are a favorite energy food, often consumed along with zivania, a perfect warm-up during the winter season. This is the most well known of all grape juice products and it closely resembles the Georgian churchkhella or the Armenian lavash. A similar name, soutzouki, is also used in Greece to denote the same product. It is possible that the name comes from the word sujuk (turkish sucuk or armenian soujoukh, which is a type of sausage) because of its shape after it has been prepared. The product is made with almonds or walnuts, shelled and soaked to turn soft, and then sewn onto a cotton thread of around 2m length. The thread is dipped several times in finished palouze, a process that may take several days since each layer has to dry on the string before a new one is put. Every time it is dipped, a new layer of palouze is added on the previous one until its diameter reaches four to six centimeters. Soujoukos is then left to dry for 5-6 days, losing much of its moisture, thus increasing its shelf life. To serve, cut in slices of 2-3 cm thick and enjoy a nutritious, natural sweet snack. Soujoukos and kiofterka can be stored in ambient temperatures only for a few days. For longer storage, keep refrigerated in vacuum packs for up to four months. They may also be stored in the freezer (in plastic bags) for much longer. Today, apart from making traditional sweet products at home, there are around twenty commercial producers, especially concentrating in the production of soujoukos. All of them are small size, rural processors that besides grape juice traditional foods produce a range of other traditional fruit preserves, spoon sweets and carob based products. Commercially produced soujoukos is occasionally made from white sugar (instead of grape juice) as a more profitable alternative but it is certainly not as traditional in flavor and less nutritious. Sugar-based soujoukos has a whitish crust and a very hard texture.